Kemba Walker heats up for 23 points as the Hornets outlast the Grizzlies on Friday night, 100-92. Tony Parker returns to San Antonio and scores 8 points in the winning effort. The Spurs pay tribute to Tony Parker. Jabari Young joins the GameTime Crew to talk Tony Parker's Legacy. NBA TV analysts discuss Tony Parker returning to San Antonio as a member of the Hornets. Bill Schoening from Spurs Radio talks about Tony Parker's return to San Antonio. 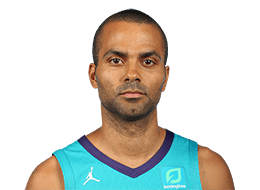 As San Antonio hosts the Charlotte Hornets tonight, relive Tony Parker's career with the Spurs. 2012-13: Earned All-NBA Second Team honors … started in 66 games, averaging a team-high 20.3 points, 7.6 assists and 3.0 rebounds in 32.9 minutes … shot .522 (519-995) from the fl oor, .348 (24- 69) from three-point territory and .845 (279-330) from the free throw line … scored in double fi gures 61 times, including 20-or-more points 40 times and 30-or-more 10 times … dished out 10-or-more assists 17 times … posted one triple-double and 17 double-doubles … led the team in scoring 36 times, assists 52 times and steals 13 times … ranked sixth in the NBA in assists … led all guards in fi eld goal percentage (.524) … only player in the NBA to average 20-plus points, 7-or-more assists, shoot .500-or-better from the fi eld and .800-or-better from the foul line … selected as a reserve to his fi fth NBA All-Star game … named Player of the Month in January averaging a team-high 21.9 points, 7.9 assists, 2.5 rebounds and 1.13 steals in 33.3 minutes while shooting .563 (135-230) in 15 games … named the NBA’s Western Conference Player of the Week for games played from 1/21 – 1/27 … registered his fi rst triple-double with 27 points (9-18 FG, 8-9 FT), 12 assists and 12 rebounds at Houston on 12/10 … fi nished with a season-high 33 points (15-23 FG, 3-4 FT) and 10 assists at Indiana on 11/23 … hit the game-winner as time expired to give the Spurs an 86-84 win over Oklahoma City in the home opener on 11/1 … posted 24 points (10-18 FG, 4-7 FT), a season-high 13 assists and 4 rebounds vs. Charlotte on 1/23 … had 30 points (10-20 FG, 10-12 FT), 11 assists, 4 rebounds and 3 steals at Sacramento 2/19 … recorded 32 points (14-27 FG, 1-4 3FG, 3-4 FT), 6 rebounds and 5 assists at Toronto on 11/25 … posted 30 points, 6 assists and 4 rebounds vs. Memphis on 12/1 … tallied 31 points and 10 assists vs. Houston on 12/28 … recorded 23 points and 12 assists at Atlanta on 1/19 … tallied 24 and 13 assists vs. New Orleans on 1/23 … registered 23 points and 10 assists at Dallas on 1/25 … posted 31 points and 7 assists vs. Phoenix 1/26 … recorded 31 points, 8 assists, 5 rebounds and 2 steals at Minnesota on 2/6 … tallied 31 points and 8 assists at Detroit on 2/8 … fi nished with 29 points and 11 assists at Brooklyn 2/10 … posted 24 points, 7 assists and 6 rebounds at Cleveland on 2/13 … tallied 31 points and 7 assists at L.A. Clippers on 2/21 … missed eight games (3/3-3/20) with a sprained right ankle … was inactive for two games and registered six DNP-CD’s … started in all 21 playoff games, averaging a team-best 20.6 points, 7.0 assists and 3.2 rebounds in 36.4 minutes … shot .460 (167-365) from the fi eld, .355 (11-31) from three-point range and .777 (87-112) from the foul line … scored in double fi gures in 20 games, including 10 games with 20-or-more and two games with 30-plus … posted two double-doubles … notched a career playoffhigh 18 assists, to go along with 15 points, 5 rebounds and 3 steals in 41:54 minutes vs. Memphis on 5/21 in Game 2 of the WC Finals … scored a postseason-high 37 points (15-21 FG, 1-1 3FG, 5-6 FT), including 25 in the second half, to go along with 6 assists in 39:34 minutes at Memphis on 5/27 in Game 4 of the WC Finals … hit a key basket with 5.2 seconds remaining to help the Spurs secure a 92-88 win at Miami in Game 1 of the NBA Finals … fi nished the game with 21 points (9-18 FG, 3-4 FT), 6 assists and no turnovers in 39:32 minutes … one of just fi ve players in NBA Finals history to fi nish with 20-or-more points, 5-plus assists and no turnovers in a Finals game … tallied 28 points (9-20 FG, 1-2 3FG, 9-10 FT), 7 assists and 4 rebounds in 36:31 minutes vs. L.A. Lakers on 4/24 in Game 2 of the fi rst round … notched 28 points, 8 rebounds and 8 assists in 47:38 minutes vs. Golden State on 5/6 in Game 1 of the WC Semifi nals … tallied 32 points (13-23 FG, 2-4 3FG, 4-7 FT), 5 rebounds and 5 assists in 35:00 minutes at Golden State on 5/10 in Game 3 of the WC Semifi nals … recorded 25 points (9-16 FG, 7-10 FT) and 10 assists in 34:14 minutes vs. Golden State on 5/14 in Game 5 of the WC Semifi nals … posted 26 points (10-14 FG, 6-8 FT) and 5 assists in 35:43 minutes vs. Miami on 6/16 in Game 5 of the Finals … fi nished with 19 points, 8 assists, 3 rebounds and 2 steals in 42:39 minutes at Miami on 6/18 in Game 6 of the Finals. 2011-12: Named to the All-NBA Second Team for the first time in his career ... started in all 60 games he appeared in, averaging 18.3 points, a career-best 7.7 assists and 2.9 rebounds in 32.0 minutes ... shot .480 (427-890) from the floor and .799 (227-284) from the free throw line ... ranked eighth in the league assists per game ... scored in double figures 52 times, including 20-or-more points 26 times, 30-or-more points seven times and 40-or-more points once ... dished out 10-or-more assists 13 times ... led the team in points 22 times, assists 51 times, steals 15 times and blocks twice ... registered 12 double-doubles ... named Western Conference Player of the Week 1/29-2/4 ... was named a Western Conference All-Star for the fourth time in his career ... won the Skills Challenge at All-Star Weekend with a time of 32.8 seconds ... became the Spurs all-time assist leader passing Avery Johnson vs. Oklahoma City on 2/4 ... recorded three 30+ points and 10+ assists games this season (3/14, 2/18, 2/15) ... marks the second time in his career that he has produced that statistical line at least three times in a single season ... finished with a season-high 42 points (16-29 FG, 10-12 FT), 9 assists, 3 rebounds and 2 steals vs. Oklahoma City on 2/4 ... had 32 points (12-19 FG, 8-9 FT) vs. New York on 3/7 ... tallied 37 points (12-24 FG, 13-13 FT) and 8 assists at Philadelphia on 2/8/12 ... recorded 30 points and 10 assists at L.A. Clippers on 2/18 ... registered 34 points and handed out 14 assists at Toronto on 2/15 ... registered 32 points and 6 assists vs. New York on 3/7 ... tallied 31 points and 7 assists vs. Washington on 3/12 ... posted 31 and 12 assists vs. Orlando on 3/14 ... finished with 28 points, handed out 8 assists and grabbed a season-high 5 rebounds vs. Houston on 1/11/12 ... recorded 20 points and a career-high 17 assists at New Orleans on 1/23 ... became the second Spur to post 20 points and 17 assists since Wes Matthews recorded 20 points and 17 assists vs. Portland on 4/13/86 ... his 17 assists was the highest output by a Spur since Avery Johnson’s 20 assist performance vs. Vancouver on 12/17/97 ... finished with 29 points and 13 assists at L.A. Lakers on 4/17 ... scored 28 points vs. Utah on 4/8 ... posted 25 points, 9 assists and 7 rebounds at Orlando on 1/18/12 ... registered three DNP – CD’s on 2/21 at Portland, 3/23 vs. Dallas and 4/9 at Utah ... was inactive vs. L.A. Clippers on 3/9 and was inactive for the final two games of the season ... started all 14 playoff games, averaging a team-best 20.1 points, 6.8 assists and 3.6 rebounds in 36.1 minutes ... shot .453 (102-225) and .807 (71-88) from the charity stripe ... ranked eighth in scoring and fourth in assists during the postseason ... scored in double figures 13 times, with 20-or-more six times and 30-or-more once ... handed out 10-or-more assists three times and posted two double-doubles ... led the team in scoring eight times and in assists in 11 games ... finished with a postseason-high 34 points (16-21 FG, 1-2 3FG, 1-2 FT) and 8 assists in Game 2 vs. Oklahoma City on 5/29 ... tallied 29 points, 12 assists, 3 rebounds and 2 steals in 42 minutes in Game 6 at Oklahoma City on 6/6 ... registered 23 points and 10 assists in Game 3 at L.A. Clippers on 5/19 ... finished with 22 points, 5 assists, 5 rebounds and 3 steals in Game 2 vs. L.A. Clippers on 5/17 ... recorded 28 points (10-19 FG, 8-10 FT), 8 assists and 4 rebounds in Game 1 vs. Utah on 4/29 ... finished with 27 points (10-17 FG, 7-8 FT) and 6 assists in Game 3 at Utah on 5/5. 2010-11: Started all 78 games he appeared in, averaging a team-best 17.5 points, 6.6 assists, 3.1 rebounds and 1.15 steals in 32.4 minutes ... shot .519 (555-1,069) from the ﬁeld, .357 (25-70) from the three-point line and .769 (233-303) from the free throw line ... ranked 15th in the NBA in assists per game and 17th in ﬁ eld goal percentage … scored in double ﬁ gures 69 times, including 29 20-plus games and four 30-plus games ... posted eight double-doubles … led the team in scoring 29 times, assists 55 times and steals 25 times ... named NBA Western Conference Player of the Week for games played 12/13- 12/19 and again for games played 3/7-3/13 … he and LeBron James were the only two players in the league to average at least 15.0 points, 5.0 assists and 3.0 rebounds, while shooting at least 50.0% from the ﬁeld … recorded a season-high 37 points (15-21 FG, 1-1 3FG, 6-10 FT) and 9 assists in 41 minutes vs. Memphis on 12/18 … posted 17 points and tied a careerhigh with 15 assists in 34 minutes vs. Golden State on 3/21 … tallied 33 points (14-22 FG, 1-2 3FG, 4-5 FT), 4 rebounds and 3 assists in 39 minutes at Dallas on 3/18 ... ﬁnished with 31 points (15-23 FG, 1-1 FT), 6 assists, 3 rebounds and 2 steals in 42 minutes at Houston on 4/1 … recorded 30 points (11-15 FG, 2-2 3FG, 6-6 FT) and a season-high 7 rebounds, 4 assists and 2 steals in 32 minutes vs. Denver on 1/16 … recorded 21 points (9-14 FG, 1-1 3FG, 2-2 FT) and 13 assists in 33 minutes vs. New York on 1/21 ... posted 20 points (8-15 FG, 1-2 3FG, 3-3 FT) and 14 assists in 36 minutes vs. Washington on 12/26 … ﬁnished with 21 points (8-17 FG, 5-6 FT), 14 assists and a season-high 5 steals in 41 minutes vs. Houston on 11/6 … tallied 24 points (9-15 FG, 2-2 3FG, 4-6 FT), 10 assists and 3 rebounds in 36 minutes vs. Orlando on 11/22 … recorded 26 points (10-16 FG, 6-6 FT), 5 rebounds and 4 assists in 35 minutes at Atlanta on 4/5 ... posted 27 points (11-18 FG, 2-2 3FG, 3-4 FT) and 6 assists in 35 minutes vs. Sacramento on 3/11 ... missed one game (3/28 vs. Portland) with a left patella contusion ... diagnosed with strained left soleus on 2/28 ... was inactive two games (3/1-3/2) … started all six games vs. Memphis in the ﬁrst round of the playoffs … averaged 19.7 points, 5.2 assists, 2.7 rebounds and 1.33 steals in 36.8 minutes … scored in double ﬁgures in six games, including four games with 20-plus … posted 24 points (9-20 FG, 6-9 FT) and 9 assists in 44 minutes in Game 5 vs. Phoenix on 4/27. 2009–10: Appeared in 56 games, including 50 starts, averaging 16.0 points, 2.4 rebounds and 5.7 assists in 30.9 minutes … shot .487 (349-716) from the floor, .294 (10-34) from the three-point line and .756 (186-246) from the free throw line … scored in double figures 46 times, including 17 20-plus games and one 30-plus game … led the team in scoring 16 times, assists 34 times, steals 8 times and blocks once … handed out 10-plus assists four times and recorded three double-doubles … finished with a season-high 32 points (10-18 FG, 12-17 FT), 7 assists, 4 rebounds and 2 steals in 30 minutes vs. Golden State on 11/25 … posted 14 points, a career-high 14 assists and a season-high 4 steals in 27 minutes at L.A. Clippers on 2/6 … registered 28 points (12-24 FG, 3-5 3FG, 1-2 FT) and 8 assists in 41 minutes at Oklahoma City on 1/13 … tallied 28 points (11-20 FG, 2-3 3FG, 4-6 FT) in 39 minutes at Indiana on 2/17 … recorded 27 points (8-14 FG, 11-12 FT), 5 assists and 4 rebounds in 36 minutes vs. Denver on 12/5 … finished with 24 points (10-16 FG, 4-4 FT), 7 assists, 3 rebounds and 2 steals in 27 minutes vs. Sacramento on 10/31 … posted 23 points (9-11 FG, 4-9 FT), 6 assists and 3 rebounds in 37 minutes at Toronto on 1/3 … registered a double-double with 22 points (8-17 FG, 6-6 FT) and 10 assists in 36 minutes vs. Houston on 1/22 … finished with 18 points (8-14 FG, 2-4 FT), 11 assists and 3 rebounds in 34 minutes vs. Sacramento on 12/9 … suffered a fractured fourth right metacarpal in the second quarter at Memphis on 3/6 forcing him to miss 16 games … returned to action at Sacramento on 4/6 … missed seven games due to a sprained left ankle (11/9-11, 11/18-19 and 1/29 -2/3) and two games due to left hip flexor sprain (2/11 and 2/21) … missed one game due to illness (at Houston on 2/26)… in total missed 26 games due to injury or illness … appeared in all 10 playoff games, averaging 17.3 points, 5.4 assists and 3.8 rebounds in 33.5 minutes… only Spur to score in double figures in all 10 playoff games… finished with a playoff-high 26 points (11-21 FG, 4-4FT) and dished out 3 assists in 36 minutes in Game 1 at Phoenix on 5/3… chipped in 23 points (10-16 FG, 3-5 FT) in 33 minutes in Game 3 vs. Dallas on 4/23… scored 10 points, grabbed 7 rebounds and dished out 8 assists in series-clinching win vs. Dallas on 4/29. 2008–09: Earned All-NBA Third Team honors … the first European-born point guard to be named to an All-NBA Team … averaged 22.0 points, 6.9 assists and 3.1 rebounds in 34.1 minutes … shot .506 (639-1,263) from the field, .292 (19-65) from three-point land and .782 (284-363) from the line … started 71 of 72 games (came off the bench on 11/28 vs. Memphis after missing the previous nine games with a sprained left ankle) … named an NBA All-Star for the third time in his career … ranked 11th in the NBA in assists, 12th in scoring and 20th in FG percentage … he and Chris Paul were the only two players in the league to average 5.0-or-more assists while shooting over .500 from the field … twice named the Western Conference Player of the Week: averaged 27.5 points and 8.3 assists to lead the Spurs to a 3-1 record from 1/26–2/1 and averaged 25.0 points and 6.0 assists while the Spurs were 3-0 from 3/23–3/29 … posted 15 double-doubles … led the team in assists 59 times, in scoring 41 times and in steals 23 times … scored in double-figures 66 times, had 20-or-more 42 times and 30-plus 13 times … scored a career-high 55 points – along with 10 assists and 7 boards – at Minnesota on 11/5 … joined Oscar Robertson as the second player in NBA history to record 55-or-more points, 10-or-more assists and 5-or-more rebounds in a single game … had 42 points (18-25 FG, 6-6 FT) and 10 assists in 39:12 minutes at Atlanta on 3/25 … had 39 points, 9 assists and 5 rebounds vs. Portland on 2/25 … finished with 37 points two times: vs. Dallas on 2/24 and at Dallas on 3/4 … led the team in scoring for 14 straight games (from 2/24–3/20) and in 18 of 19 games (from 2/24–3/29) … during that 19-game span averaged 26.2 points and 7.9 assists … missed nine games (11/11–11/26) after suffering a sprained left ankle vs. Miami on 11/7 … recorded a DNP-CD at Denver on 2/3 … in the 2009 playoffs averaged 28.6 points, 6.8 assists, 4.2 rebounds and 1.20 steals in 36.2 minutes in five games … shot .546 (59-108) from the field and .710 (22-31) from the line … scored a playoff career-high 43 points (18-29 FG, 2-5 3PT-FG, 5-8 FT) in Game 4 at Dallas on 4/25 … had 38 points (16-22, 0-2 3PT-FG, 6-9 FT) and 8 assists in Game 2 vs. Dallas on 4/20. 2007–08: Appeared in 69 games … averaged 18.8 points, 6.0 assists and 3.2 rebounds in 33.5 minutes … shot .494 (515-1043) from the field, .258 (17-66) from three-point land and .715 (248-347) from the line … ranked 14th in the NBA in assists … named the NBA Western Conference Player of the Week on 11/26 after averaging 26.5 points, 8.3 assists and 3.0 rebounds as the Spurs posted a perfect 4-0 week … led the team in scoring 24 times, assists 52 times and steals 13 times … scored in double-figures 63 times … finished with 20-or-more 32 times and 30-plus four times … posted three double-doubles … had back-to-back 30 point games in November: had 31 points and 9 assists at Atlanta on 11/20 and finished with 32 points and 9 assists vs. Orlando on 11/21 … had 32 points and 11 assists at Sacramento on 4/14 … scored 31 points and handed out 8 assists in a season-high 42:18 minutes at Golden State on 1/7 … had 29 points (12-18 FG, 5-7 FT) and 11 assists vs. Washington on 11/28 … in the final game of the season posted his third double-double finishing with 24 points and a season-high 12 assists in 29:19 minutes vs. Utah on 4/16 … missed 13 games due to injury … missed four games (12/13–12/19) with a sprained left ankle and missed nine games (1/29–2/19) due to left ankle inflammation … in the 2008 Playoffs averaged 22.4 points, 6.1 assists and 3.7 rebounds in 38.5 minutes … ranked 10th in the postseason in scoring, 10th in assists and 13th in FG percentage (with a .497 mark) … was the only Spur to score in double-figures in all 17 playoff games … finished with 20-or-more 10 times and had 30-plus five times … posted three double-doubles in the postseason … scored a playoff career-high 41 points (17-26 FG, 1-3 3PT-FG, 6-7 FT) – to go along with 12 assists, 5 rebounds and 2 steals – in 40:30 minutes in Game 3 at Phoenix on 4/25 (the fourth Spur to score 40-plus in a playoff game, joining Duncan, Gervin and Robinson) … finished with 31 points and 11 assists in 40:41 minutes in Game 3 vs. New Orleans on 5/8 … had 18 points, a playoff-career-high 10 rebounds and 6 assists in 41:03 minutes in Game 1 at Los Angeles on 5/21 … scored 32 points in Game 2 vs. Phoenix on 4/22 … had 31 points and 8 assists in Game 5 vs. Phoenix on 4/29 … logged a playoff-career-high 51:28 minutes (scoring 26 points) before fouling out in the Spurs double-overtime Game 1 win vs. Phoenix on 4/19. 2006–07: Named the 2007 Finals MVP … first European-born player to win the award … appeared in 77 regular season games … averaged 18.6 points, 5.5 assists, 3.2 rebounds and 1.06 steals in 32.5 minutes … shot .520 (570-1,096) from the field, .395 (15-38) from three-point land and .783 (274-350) from the line … he and Steve Nash were the only players in the league to average at least 15.0 points and 5.0 assists while shooting .500 from the field … named an All-Star for the second straight season (had 8 points and a game-high 10 assists in 23:44 minutes in the 2007 All-Star Game) … ranked 27th in the NBA in scoring, 19th in assists and 19th in FG percentage … led the team in scoring 28 times, assists 46 times and steals 20 times … scored in double-figures 68 times with 20-or-more 31 times and 30-or-more four times … posted four double-doubles … scored a season-best 35 points vs. Phoenix on 4/5 … had 33 points (12-17 FG, 9-12 FT) and 6 assists vs. New York on 11/11 … finished with 30 two times: vs. Boston on 3/17 and vs. Portland on 4/9 … handed out a career-high 15 assists vs. the Clippers on 12/8 … missed three games (1/7, 3/3 and 3/5) with a left hip strain … was on the inactive list for the final two games of the season … in the 2007 Playoffs averaged 20.8 points, 5.8 assists, 3.4 rebounds and 1.10 steals … scored in double-figures in all 20 games … had 20-or-more 11 times and 30-or-more three times … finished with 32 points, 8 assists and 3 steals in Game 1 at Phoenix on 5/6 … scored 30 points in 41:07 minutes in Game 6 vs. Phoenix on 5/18 … had 30 points (13-20 FG, 1-1 3PT-FG, 3-4 FT) in Game 2 vs. Cleveland on 6/10 … posted two double-doubles: had 16 points and a game-high 10 assists in Game 5 vs. Denver on 5/2 and finished with 17 points and a playoff-career-high 14 assists in 39:27 minutes in Game 2 vs. Utah … in the Finals averaged a team-high 24.5 points and shot a team-best .568 (42-74) from the field. 2005–06: Led the team in scoring and assists (marking the first time in the Spurs 30-year NBA history that a point guard led the team in scoring) … averaged 18.9 points, 5.8 assists, 3.3 rebounds and 1.04 steals in 33.9 minutes in 80 games … shot .548 (623-1,136) from the field, .306 (11-36) from three-point land and .707 (253-358) from the line … ranked third in the NBA in FG percentage … the first time since 1974–75 that a point guard ranked in the top three in FG percentage (when Golden State’s Butch Beard ranked second in the NBA with a .528 mark) … his .548 mark is the 10th highest single-season mark ever recorded by a point guard … ranked 27th in the NBA in scoring and 19th in assists … named the Western Conference Player of the Week on 2/13 after leading the Spurs to a perfect 3-0 week while averaging 22.7 points and 8.3 assists (the first Spurs point guard to earn player of the week honors) … led the team in scoring 30 times, in assists 50 times and in steals 22 times … posted eight double-doubles … scored in double-figures 74 times … finished with 20-or-more 36 times and 30-or-more four times … scored a career-high 38 points (13-18 FG, 2-2 3PT-FG, 10-13 FT) in 38:55 minutes at Miami on 1/20 … finished with a game-high 32 points (12-19 FG, 8-8 FT) and a season-high 13 assists at Toronto on 2/8 … hit 12-13 FG and 4-4 FT to finish with 28 points in 35:08 minutes at Memphis on 1/16 … became the ninth player in Spurs history to be named to an All-Star Team (had 8 points and 4 assists in 20 minutes in the 2006 All-Star Game) … teamed with Steve Kerr and Kendra Wecker to win the Shooting Stars competition (they set an event record finishing the shooting challenge in 25.1 seconds) … did not play at the L.A. Clippers on 3/28 due to a right shin contusion … logged a DNP-CD in the season finale at Houston on 4/19 … in the 2006 playoffs averaged 21.1 points, 3.8 assists and 3.6 rebounds in 36.5 minutes … scored 20-or-more eight times in the postseason … scored 33 points in 45:37 minutes at Dallas on 5/15 … finished with 31 points, 5 rebounds and 4 assists at Sacramento on 5/5. 2004-05: Appeared in 80 games, averaging 16.6 points, 6.1 assists, 3.7 rebounds and 1.23 steals in 34.2 minutes … shot .482 (539-1,118) from the field, .276 (43-156) from three-point land and .650 (210-323) from the line … ranked 13th in the NBA in assists … ranked third among NBA point guards in field goal percentage (behind Steve Nash and Jason Terry) … posted single-season career highs in assists, rebounds and steals … recorded seven double-doubles … scored in double-figures 71 times with 20-or-more 29 times and 30-or-more twice … had a season-high 35 points – along with 12 assists and 6 rebounds – in 46 minutes at Golden State on 4/10 … scored the game-winning layup with 2.9 seconds left to give the Spurs a 136-134 double-overtime victory (the previous night had 27 points and 9 assists in a career-high 53 minutes in the Spurs 125-124 double-overtime win at the L.A. Clippers on 4/9) … finished with 30 points at Phoenix on 3/9 … faked a three and then drove to the basket for the game winning layup with 7.8 seconds left in the Spurs 80-79 victory at the L.A. Clippers on 1/19 (in the game scored 15 of his game-high 25 points in the third quarter) … scored 20-plus in five straight games (2/3–2/13) averaging 22.6 points while shooting .537 (44-82) from the field during the span … averaged 18.1 ppg in the final 56 games of the season after averaging 13.3 ppg in his first 24 games … Spurs were 22-2 when he handed out 8-or-more assists … did not play at New Orleans on 3/14 due to a left quadriceps contusion and did not dress at Memphis on 4/18 due to a stomach virus … in the 2005 playoffs averaged 17.2 points, 4.3 assists and 2.9 rebounds in 37.3 minutes … in the postseason ranked 29th in scoring and 18th in assists … scored in double-figures 22 times in 23 playoff games with 20-or-more seven times … finished with 29 points three times: had 29 points and 7 assists in the Spurs Game 4 win at Denver on 5/2, finished with 29 points in the Spurs Game 1 win vs. Seattle on 5/8 and had 29 points and 7 rebounds in the Spurs Game 1 win at Phoenix on 5/22 … averaged 20.4 points in the Western Conference Finals versus Phoenix. 2003-04: Appeared in 75 games, averaging 14.7 points, 5.5 assists and 3.2 rebounds in 34.4 minutes per contest … shot .447 (423-946) from the field, .312 (62-199) from three-point land and .702 (191-272) from the line … ranked 16th in the NBA in assists … scored in double-figures 63 times with 20-or-more 12 times … posted seven double-doubles … scored a season-high 29 points three times: vs. Denver on 2/28, at Golden State on 3/15 and at the L.A. Lakers on 4/4 … had a season-best 14 assists – along with 19 points – in 32 minutes vs. the L.A. Clippers on 12/23 … recorded a career-high 6 steals at Seattle on 3/3 … hit a 21-foot jumper with 3.8 seconds left to give the Spurs an 86-84 win at Phoenix on 1/23 … missed the first seven games of the season after suffering a sprained left ankle in a preseason game vs. New York on 10/17 … in the postseason averaged 18.4 points, 7.0 assists, 2.1 rebounds and 1.30 steals in 38.6 minutes in the team’s 10 playoff games … tied for fifth in assists in the postseason and ranked 16th in scoring … scored in double-figures eight times in the postseason … in the first round versus Memphis averaged 21.0 points, 8.5 assists and 2.0 rebounds in 37.0 minutes … had 29 points and 13 assists in the Spurs series-clinching Game 4 win at Memphis on 4/25 … had 30 points in the Spurs Game 2 win vs. the Lakers on 5/5. 2002-03: One of two Spurs to appear in all 82 games (along with Bruce Bowen) … averaged 15.5 points, 5.3 assists and 2.6 rebounds in 33.8 minutes … shot .464 (484-1,043) from the field, .337 (82-243) from three-point land and .755 (219-290) from the line … his 15.5 ppg scoring average was the highest by a Spurs point guard since James Silas averaged 17.7 ppg in 1979–80 … scored 20-or-more points 21 times and the Spurs were 20-1 in those games … led the team in assists 49 times and in scoring 13 times … scored a season-high 32 points three times: had 32 points and 6 assists in 35 minutes vs. Dallas on 12/11 … finished with 32 points and 10 assists at Chicago on 12/28 … had 32 points in 40 minutes vs. Sacramento on 3/1 … posted four double-doubles … had 10 points and 12 assists vs. Minnesota on 11/11 … finished with 20 points, a season-high 13 assists and 6 rebounds at Orlando on 1/31 … had 21 points, 10 assists and 8 rebounds at Golden State on 2/5 … played for the Sophomore squad in the 2003 Rookie Challenge finishing with 8 points, 6 assists and 3 rebounds in 23 minutes … participated in the inaugural Skills Challenge at the 2003 NBA All-Star Weekend … started all 24 playoff games, averaging 14.7 points, 3.5 assists and 2.8 rebounds in 33.9 minutes … scored in double-figures 15 times in the postseason with 20-or-more seven times (Spurs were 6-1 in those games) … twice finished with 29 points: at Phoenix on 4/25 and at Dallas on 5/23 … had 27 points and 5 assists in the Spurs Game 6 series-clinching win at Los Angeles on 5/15 … had 25 points and 5 assists in 44 minutes in the Spurs Game 4 win at Dallas on 5/25 … finished with 26 points and 6 assists in 43 minutes in the Spurs Game 3 win at New Jersey on 6/8. 2001-02: Named to the All-Rookie First Team becoming the first foreign-born guard to earn the honor … appeared in 77 games … averaged 9.2 points, 4.3 assists, 2.6 rebounds and 1.16 steals in 29.4 minutes … shot .419 (268-639) from the field, .323 (61-189) from three-point land and .675 (108-160) from the line … led the team in assists and steals … moved into the starting lineup in the fifth game of the season and finished with 12 points, 4 assists and 3 rebounds in 32 minutes vs. Orlando on 11/6 … earned 72 starts … the only rookie on the Spurs roster … among NBA rookies ranked eighth in scoring, second in assists, seventh in steals, fifth in three-pointers made and fifth in minutes … scored a season-high 22 points in 38 minutes at Charlotte on 11/8 … posted two double-doubles: had 16 points and a career-best 10 rebounds in a seasonhigh 45 minutes vs. Houston on 3/7 and finished with 14 points and a season-best 10 assists vs. Detroit on 4/12 … led the team in assists 35 times and in steals 27 times … twice hit game-winning shots during the season: hit an 18-foot jumper with 6.8 seconds left to give the Spurs a 90-88 win at Seattle on 4/3 … connected on a coast-to-coast layup at Utah on 4/17 with 2.0 seconds left as the Spurs beat the Jazz 86-84 to claim the Midwest Division Title … missed five games after suffering a sprained right ankle at New Jersey on 1/14 (on the injured list from 1/15–1/25) … played in the 2002 Rookie Challenge and finished with 6 points, 8 assists and 3 steals in 21 minutes for the victorious Rookie squad … in 10 playoff games averaged 15.5 points, 4.0 assists and 2.9 rebounds in 34.1 minutes … finished with 24 points and 5 assists in Game 3 vs. the Lakers … had 23 points, 5 rebounds and 4 assists in Game 3 at Seattle on 4/27. 2000–01: Appeared in 30 games as the starting point guard for Paris Basket Racing in the French A League … in French League play averaged 14.7 points, 5.6 assists, 2.7 rebounds and 2.30 steals in 33.1 minutes per contest … shot .489 (163-333) from the field, .304 (34-112) from three-point land and .748 (80-107) from the line … posted a 2.55-to-1 assist-to-turnover ratio … played in the 2001 French All-Star Game … had 10 points and 3 assists in 15 minutes of action … in European Cup play averaged 14.3 points, 3.1 assists and 1.8 rebounds in 31.4 minutes in 10 games. 1999–2000: In his first season with Paris Saint Germain Racing in the French A League appeared in 23 games as the team’s backup point guard … averaged 3.9 points and 1.7 assists in 10.0 minutes in French league play … also saw action in 11 games in the European Cup … averaged 5.8 points and 1.8 assists in 13.2 minutes in the tournament. Full name is William Anthony Parker … was born in Belgium and raised in France … fl uent in English and French … father, Tony Sr., played at Loyola in Chicago and then on the professional level overseas … his mother is from Amsterdam and currently lives in Paris … has two younger brothers, TJ and Pierre … TJ played three seasons at Northwestern University and is now in his third professional season in France … spends a lot of time on the internet … has his own website: TP9.net … donates a block of 20 tickets for each home game to underprivileged youth … a big video game fan (enjoys all of the sports games) … favorite movies include Face/Off, Men of Honor, Bad Boys and Meet Joe Black … likes rap, listing Jay-Z, 50 Cent and the Ruff Ryders as his favorites.